learning environment both in and outside the classroom.The Ninth Edition is available with MasteringGeography(tm) , the most effective and widely used online tutorial, homework, and assessment system for the sciences.This program will provide an interactive and engaging learning experience for you. Here's how: Personalize learning with MasteringGeography: MasteringGeography provides students with engaging and interactive experiences that coach them through introductory physical geography with specific wrong-answer feedback, hints, and a wide variety of educationally effective content.Leverage strong pedagogical tools and a structured active learning path: The text reinforces central hallmark physical geography themes of Earth systems, human-Earth relations, and global climate change by providing a consistent framework for mastering chapter concepts. Teach with current and relevant content. An emphasis on currency provides you with compelling reasons for learning physical geography. Note: You are purchasing a standalone product; MasteringGeography does not come packaged with this content. 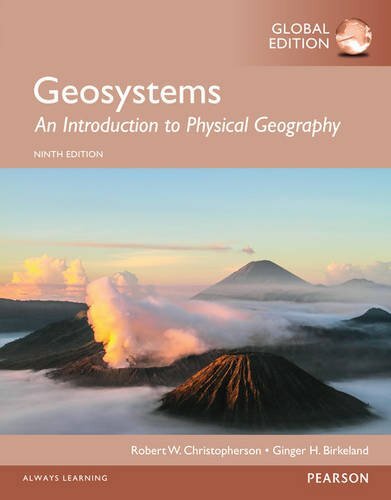 If you would like to purchase both the physical text and MasteringGeography search for ISBN-10: 0321948882 /ISBN-13: 9780321948885. That package includes ISBN-10: 0321926986 /ISBN-13: 9780321926982 and ISBN-10: 0321948408 /ISBN-13: 9780321948403. MasteringGeography is not a self-paced technology and should only be purchased when required by an instructor.